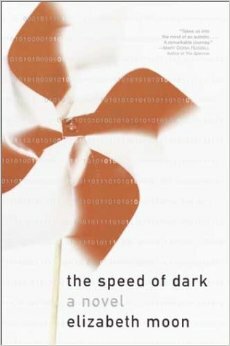 The Speed of Dark by Elizabeth Moon is another one of those books that simultaneously changes how I view the world while making me more compassionate about those who are different. The story is about a young man named Lou who is neuroatypical, and has a gift for spacial relationships and mathematics. He lives independently, likes his work, likes who he is. And then he's offered a chance to have his Autism "cured" and live a "normal" life. The story explores how our uniqueness as individuals both restrains and frees us, defines who we are and gives us the opportunity for change. Elizabeth Moon has a son on the Autism spectrum, and her insight into Lou and his thought processes are profound and revealing. This book gave me a short glimpse into how a neuroatypical individual might view the world, their place in it, and look at the rest of us. Both sad and uplifting, this book looks at the concept of choice, and how our choices define us in ways we cannot begin to understand. I've read a lot of Elizabeth Moon's books, and liked most of them, but for me this is her masterwork.